Non ne vides quod domus mea destruitur? The hagiography of St Francis, whose memorial we celebrate today, provides one of the foundational quotes of Locus Iste. This makes a good opportunity to put down some of the perspective behind the work on this site. Non ne vides quod domus mea destruitur? Vade igitur et repara illam mihi. Do you not see that my house has fallen into ruin? Go, therefore, and restore it to me. Why is this a foundational concept? The first line appeals to my general cynicism as one who has never been fully satisfied by any specific expression of church as artifact or as event. It is far too easy to be critical of seemingly ruinous housekeeping (America the Beautiful during mass? Srsly?). But the exact command in the second line, with its broader implications and the Franciscan example, challenges that that cynicism not be turned inward. The answer to the shortcomings of the house of God on earth is not retreating into our individual tastes but in returning to God, and that means giving up our individual preferences for physical expression and our immediate concepts of how we might want to make things better. Francis initially took this command to mean the physical state of the church building in which he was then praying, and so he sold some of his possessions to fund its restoration. He also sold some of his father's possessions, which created a spot of bother. 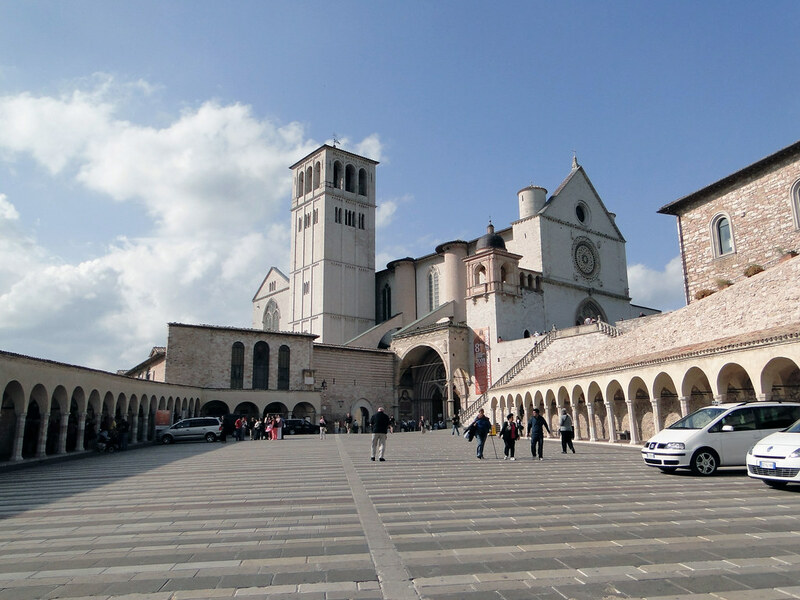 Thus one of the first major publicly visible acts of poverty undertaken by St Francis—and the immediate cause for his disowning of his father's wealth—was architectural. Here is the fruit of that labor (the left portion of the later expanded façade, with a later expansion to the right). Not sure how much of the composition is original, but if the fenestration is it would be pretty interesting. However, the command expanded in meaning for St Francis as that "domus" came to have meaning beyond the destitution of a particular church building. The dual meanings of church (people and building) and all of the dwelling images scattered throughout our theologies and liturgies ("Lord, I am not worthy that you should enter under my roof...") should never be considered unfortunate or accidental or a problem to be solved. The foundation of the Franciscan Order, especially its reformational aspects, more fully answers that command. And that is a good perspective to have when approaching church-building activities: it is but one aspect of the turning-over of our common life that is the church—and the dwellings it begets—back to the Lord. The moral of this story vis-a-vis church-building is not the condemnation of edifice-making (St Francis's first response was not incorrect, just incomplete); however, there are those who make that argument using St Francis as a model for better ways to allocate church funds. I have sympathy for that inclination, and it is a good check for those of us who are active in the profession not to simply assume that a building is the answer to any and all problems. A better moral is that it does require we consider the place of a building in the context of the whole complex life of the church with its needs variously practical and impractical. We must never build for its own sake or attempt Beauty without seeking the Truth and Goodness that comes before it and issues from it. To round out the history, the restored church and convent of St Damian (San Damiano) became the first home of the Order of the Poor Clares in 1212. Its chapel (below) houses a replica of the original conversant San Damiano crucifix, which now hangs in a side chapel of the St Clare Baslica (Basilica di Santa Chiara), also in Assisi. So a brief reflection to mark the feast of St Francis, who is a far more challenging and complex figure than we tend to consider. Someone was right to think we would do well to give him more thought. Hopefully in focusing on this one hagiographical excerpt I'm not falling into the popular reductionism and appropriation of the saint.